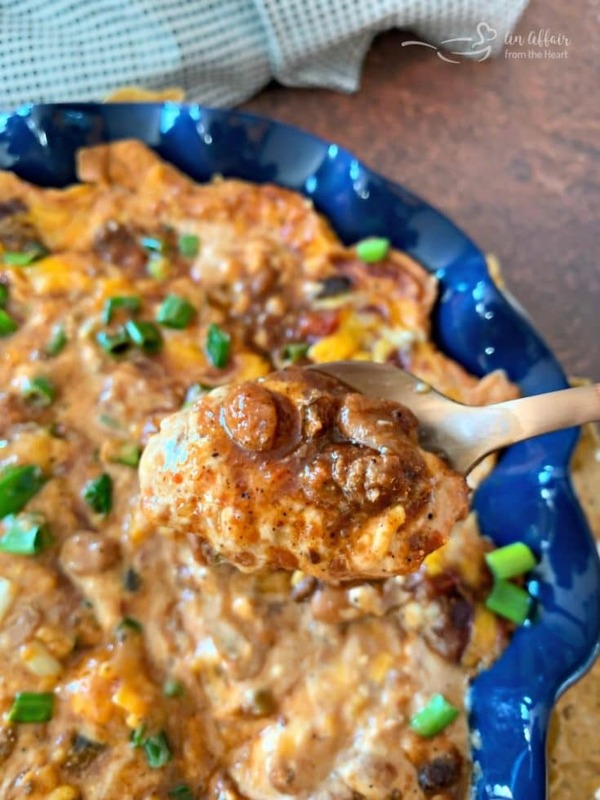 Chili and Cheese Bean Dip is a warm refried bean dip, baked up with chili and cheese. Make with leftover chili or canned. Serve with corn or tortilla chips. 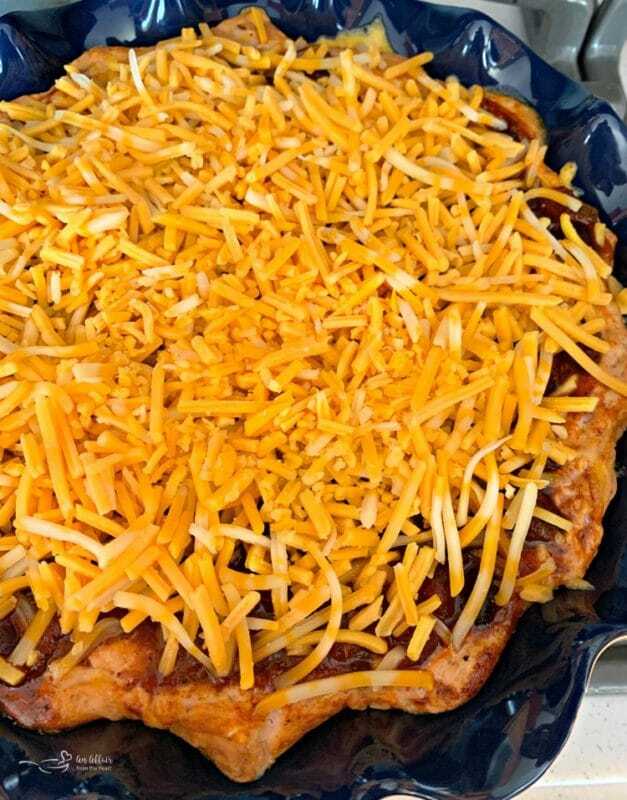 Chili Cheese Bean Dip — were there any other glorious words ever spoken? 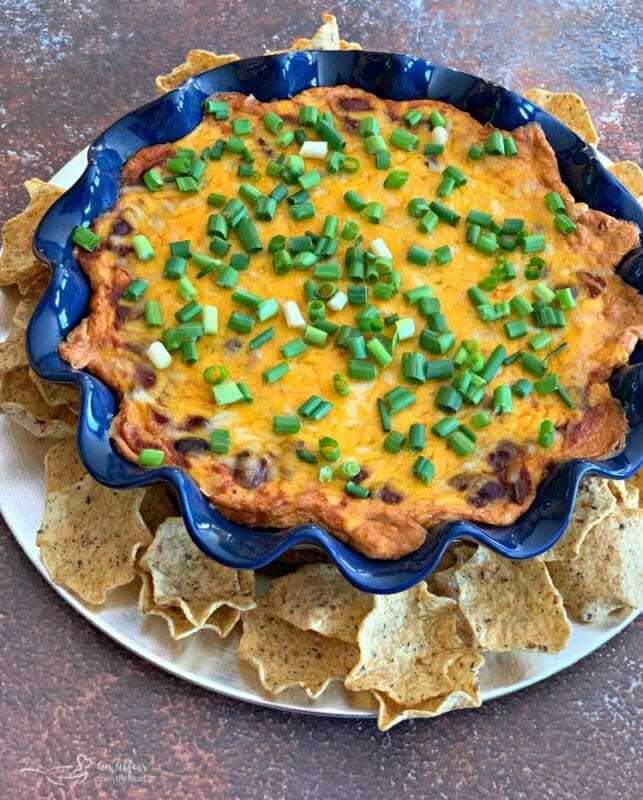 Out of all the dips — I think bean dip is one of my most favorites. I can’t even leave it alone when it gets set in front of me. Whether you are dipping tortilla chips or Fritos corn chips, I am a happy camper. I made three new recipes that day, but hadn’t really planned to make any — so it was all about creating something with what I had on hand. One thing I always have in my pantry? Canned refried beans. You all know, there is no shortage of cheese around here either. Digging into the fridge, I saw the leftover chili from a couple of nights before, and I knew I could make something delicious. Turn a can of refried beans into restaurant quality in a matter of minutes! Only two simple add-ins and it’ll feel like you’re eating at your favorite Mexican restaurant, right at home! Click the photo for the recipe and video! 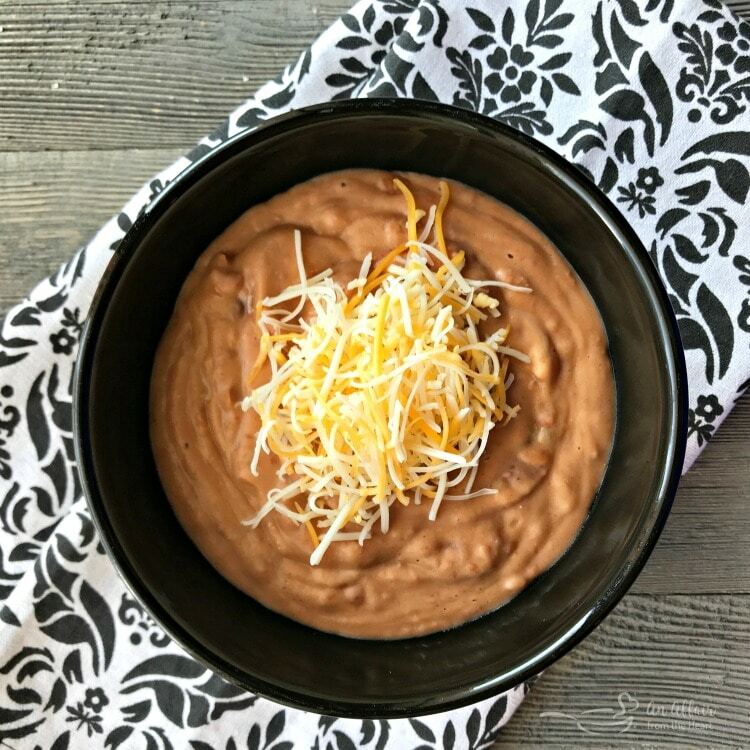 One of my most popular recipes every single day is this one for Making a Can of Refried Beans Taste like a Restaurant’s. So many have tried it, and it always gets rave reviews. You can pop over and watch the how to video and see what I do to achieve that. We love refried beans, and eat them a lot. Traditional, homemade refried beans in minutes. Top them with cilantro if you desire — add them in or serve them as a side to your favorite Mexican dishes, or even bake them up with some cheese for a delicious bean dip. Click for the recipe! Of course, some will scoff, and say that canned refried beans don’t hold a candle to homemade. So, guess what? I have you covered there, too. 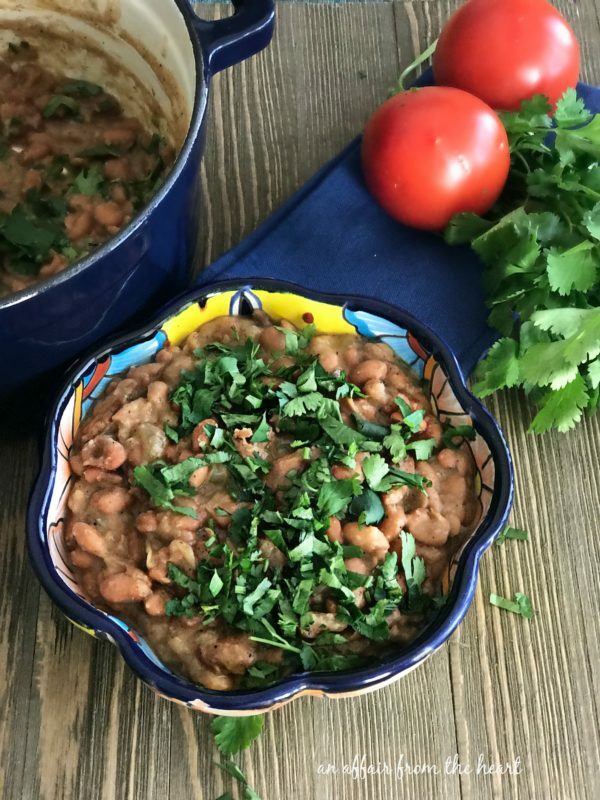 This recipe for Easy Homemade Refried Beans is equally delicious, they just take a little extra work. I used my mixer to cream together the refried beans and cream cheese with half of the cheese and the hot sauce. I spread it into a pie plate. I love this scalloped edge pie plate! I had made chili that week, and had leftovers, so I used my own chili. But I measured it so that if you don’t have your own, you can substitute a can of chili from the store. Of course, mine if full of beans and meat. I used both hamburger and steak in this batch, but you can use meatless for a vegetarian bean dip. I have lots of different chili recipes on my blog. Typically when I make chili, it sort of just happens. I start throwing stuff in the pot and tasting it until I like it. I did, at one point, measure ingredients and made a 3 Bean Chili that I put on my blog. Bake it for a bit and then add the remaining shredded cheddar cheese to the top and bake until it’s nice and melty. Because if it’s not nice and melty, there’s no cheese pull — you gotta have cheese pull, am I right? So many Dip Recipes — Click to see them all!! 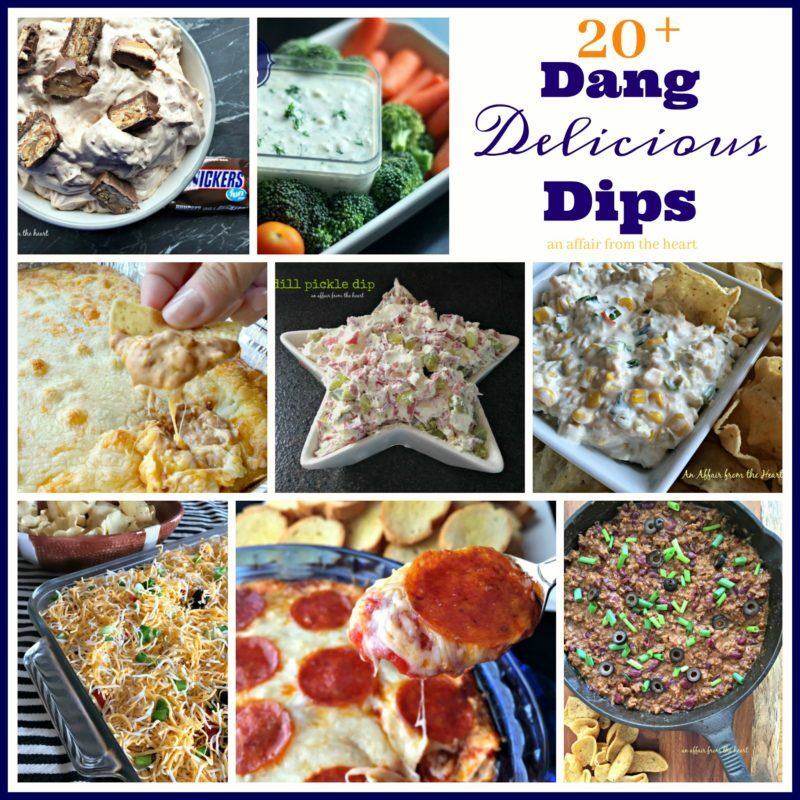 I have LOTS of Dip Recipes on my blog — It’s hard to choose just one, but you can see them all here! 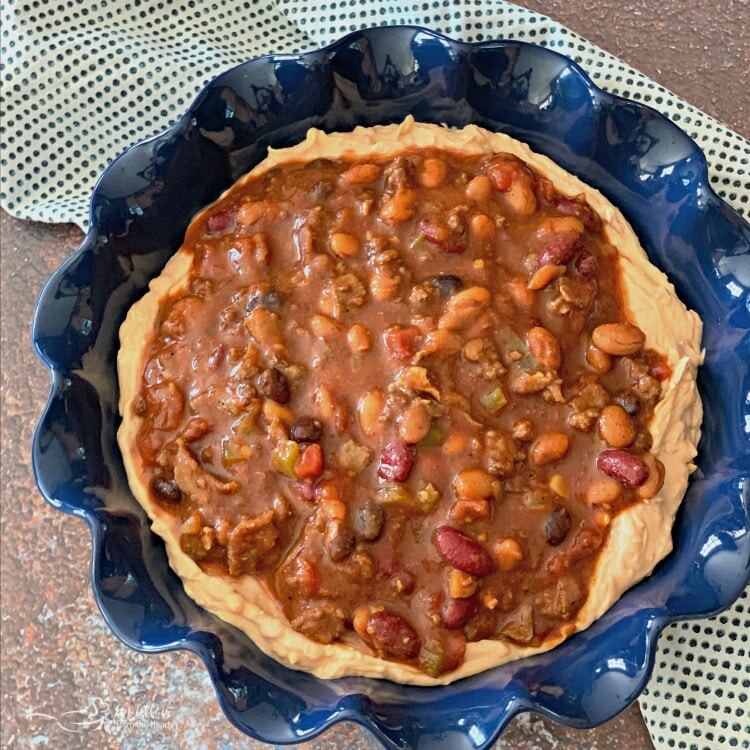 Let’s make some Chili Cheese Bean Dip so we can get to dippin’ shall we? Sliced green onions for serving. With a mixer, beat your cream cheese until smooth. Scrape the bowl, add in refried beans and hot sauce and cream together. Fold in half of shredded cheese. Spread into the bottom of a deep dish pie plate. Bake for 20 minutes. Remove and sprinkle with remaining cheese. Bake 5 minutes more, or until cheese is melty and bubbly. Top with sliced green onions and serve hot with corn or tortilla chips. Prepare ahead of time and bake later. OR Prepare in a grill safe pan and take to tailgate. 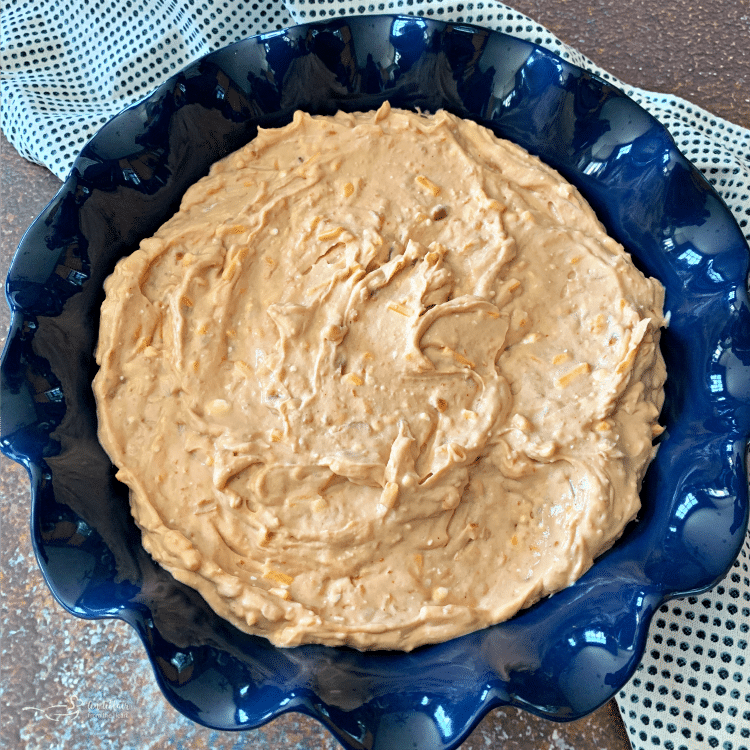 Prepare with fat free cream cheese and fat free refried beans for less guilt. I love that you made this in that pretty pie dish. What a great appetizer for sharing, and I’d even serve it for dinner. Love! You are definitely speaking my language here!! We always have these ingredients on hand, too- especially the cheese! This sounds so perfect for a Super Bowl party. I’d be way more interested in this dip than in the game, haha! Glad you whipped this up to share with us! This Dip looks unique, creamy and delicious. Great for a Party Dip with some interesting Snacks. Will go for it when I have my Kitty Party. This would be perfect for our superbowl party! Love a good cheese dip. YES! This looks perfect for game day! Chili cheese anything makes me happy. Also love that you put this in a pie plate. So pretty and perfect for dipping. I made this the other night and we ate all of it! It ended up being our dinner and not just an appetizer! We had some friends over after a concert today and whipped this up for an easy snack! it was a HUGE hit! Thrilled you loved it too!! Oh man, this recipe is dangerous for me because I just, couldn’t, stop, eating! Lol. Seriously though, it was so, so good! 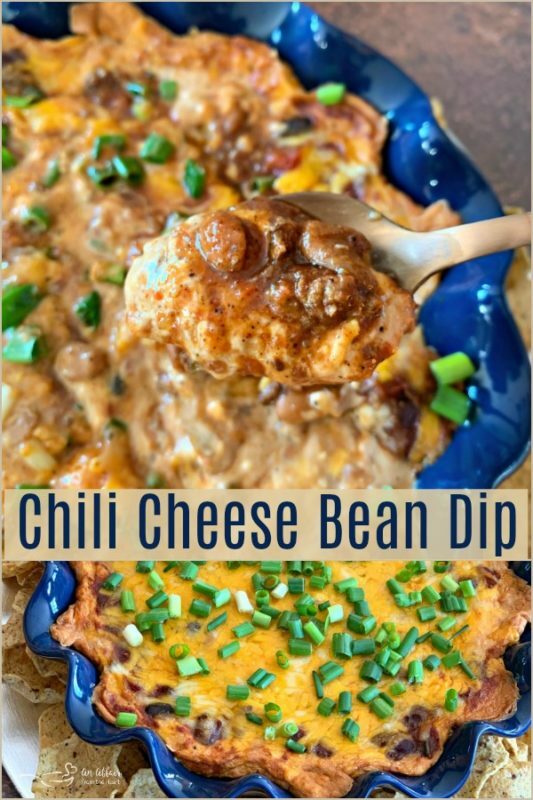 Dips are my favorite party of the football party and this one’s a big winner! Thanks for the recipe! Thank you so much!! That means so much coming from YOU!! No finer words WERE spoken than “Chili Cheese Bean Dip”. I want to make this this weekend for the big game. Or, really, I want to EAT this this weekend. Can I come over? I can also eat my weight in bean dip and fritos. This chili cheese bean dip look so good and I don’t think I can wait until super bowl to make it nor do I think I want to share! Great flavor combo! Spicy and cheesy – the kind of dip we prefer. Thanks for sharing! I agree those may just be the four best words in the English language. Sounds perfect for game day! 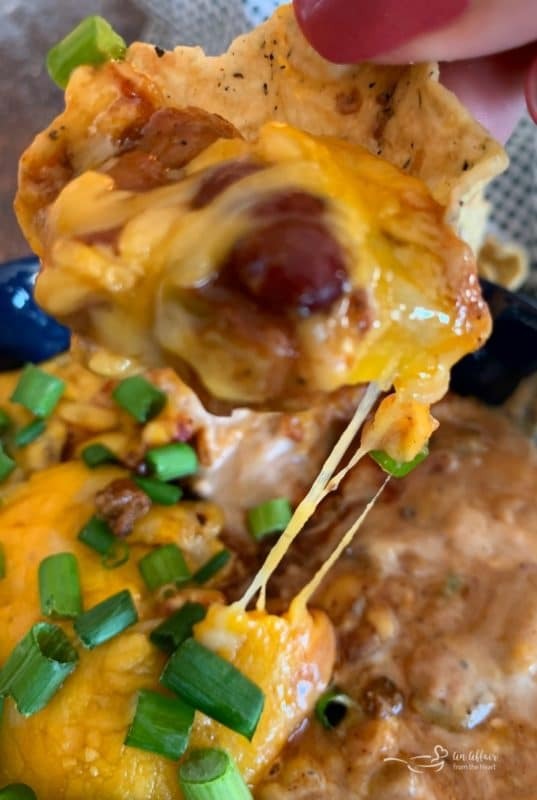 Oh you had me at chilli cheese bean dip haha, but just look at all those layers haha – so mouth-watering! I’m just drooling here! These are all my favorite flavors and will be a hit for the Super Bowl. I know exactly when you saw the sun because I did too and boy did it put a pep in my step! This would make a wholllleeee lot of hungry football watchers HAPPY. The perfect game day snack!! You are so creative with dips! Adding the chili is so smart and tasty! Just the right amount of added texture with the creamy refried beans. Making this again, and again! Happy you loved it, too! Yum! Love this for an appetizer or for putting in the middle of the table for dinner! Love that it’s served in pie plate – so fun!